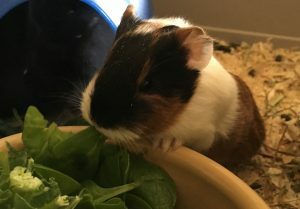 Comments Off on Unexpected guinea pig babies! 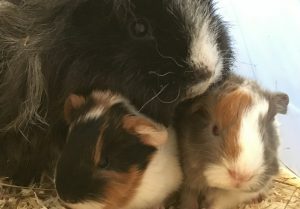 It seems that Hope Vets have become responsible for the nursery guinea pigs and after poor Truffles passed away we found Twix some new companions: Buttons and Rolo. They settled well but Buttons just got bigger and bigger, it turns out she had a rather large surprise up her sleeve having been pregnant before we even got her! After much much much not very patient waiting (by Steph) she gave birth to two healthy baby guinea pigs, Anthony and Cleopatra! They immediately began tucking into their breakfast and running around causing mischief. Guinea pigs are one of the only species who are born completely independent, able to eat solid food, walk around and are covered head to tiny toe in fur! Even after many years vetting we have all been absolutely fascinated and amazed by our new babies.